Angle Guide For 130 deg., 135 deg. Cannulated Screw Driver, Guide Wires 3 Nos. 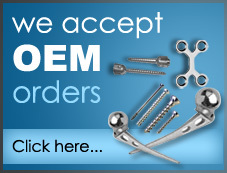 We are leading manufacturer and supplier of trauma implants and orthopaedic instruments sets. We exports trauma implants and orthopaedic instruments like orthopedic screw sets, bone plates sets, dhs plate set, angle blade plate set and cannulated cancellous set to countries like USA , Uk, Germany, Sri Lanka and others.